While I was putting Cannelloni in the freezer I have noticed a bag of corn kernels that we saved last summer. Out came the corn and since I have also spotted avocado in a basket on my kitchen island, recipe for a meal was born. Because this recipe is sort of Mexican in nature I have included lime and cilantro as well. Put corn, avocado and chicken stock in a blender and liquefy for at least 2 minutes. Strain into a soup pot through medium mesh strainer pressing on solids to remove as much corn milk as possible. Of course, if skin from corn kernels doesn’t bother you, you can omit this step. Place pot on medium heat and bring to slow simmer. Add cream and bring back to simmer, flavor with lime juice, salt and pepper. 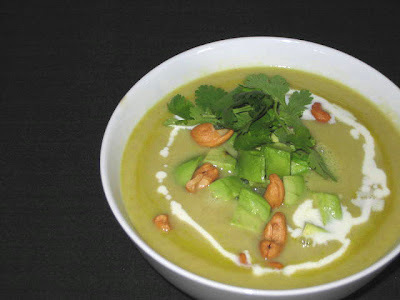 Serve in a bowl and garnished with cilantro, chopped avocado and cashews. If you are using fresh corn, steam the corn for 10 minutes first. This soup must be excellent in summer served cold.